OSX users rejoice, you can celebrate Halloween in style. 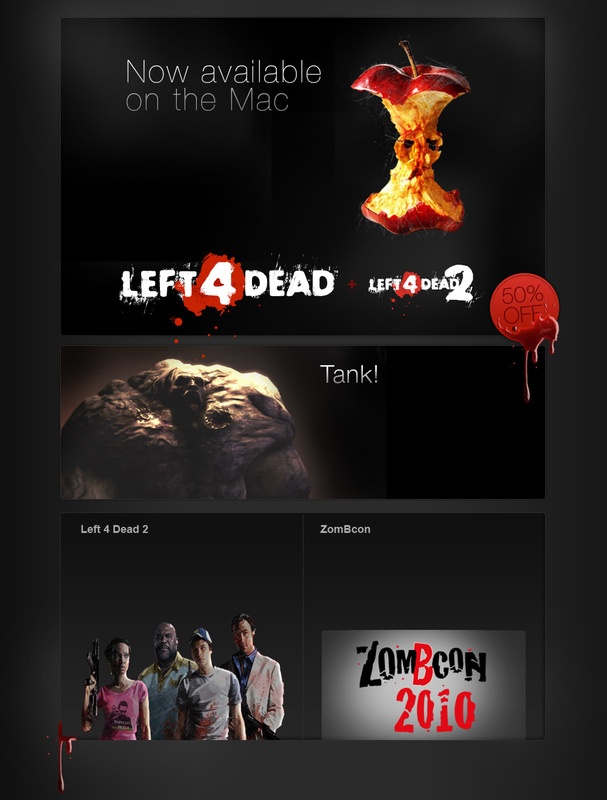 Left 4 Dead is available for Mac users everywhere. What does this mean for Mac users? You get Left 4 Dead and all the previously released DLC for one low price. Plus, thanks to steam play you can play in the same games on the same servers as PC users. Just in case you missed The Sacrifice Sale, we have put Left 4 Dead on sale. Get it here. On October 5th we promised the OSX version of L4D by Halloween. Since hell froze over and we actually made the date, we brought back some other updates – ALL THE WAY FROM HELL! These updates for L4D include tank spawns in stasis until a player takes over, no tank slow down while on fire and we turned off auto-spawning in Finales (plus a few more goodies). Not to leave Left 4 Dead 2 out in the cold (also available for OSX), we are updating our servers with a new featured community campaign – The Haunted Forest! It’s a forest, and it’s haunted! This Halloween, you can either go out and get apples with razor blades, or stay home and Play the Haunted Forest – the choice is yours. Get it here. Four of us from the Left 4 Dead 2 team will be journeying all the way to Seattle this weekend to join the likes of George Romero and Bruce Campbell for the 1st annual Zombcon. We will be hosting a panel on Sunday at 1pm discussing the creation of the Charger and one our favorite survivors, Ellis. Make sure to stop by as we will also be handing out one of a kind concept art and shwag. Check it out.